I recently went to Orlando to visit family friends. 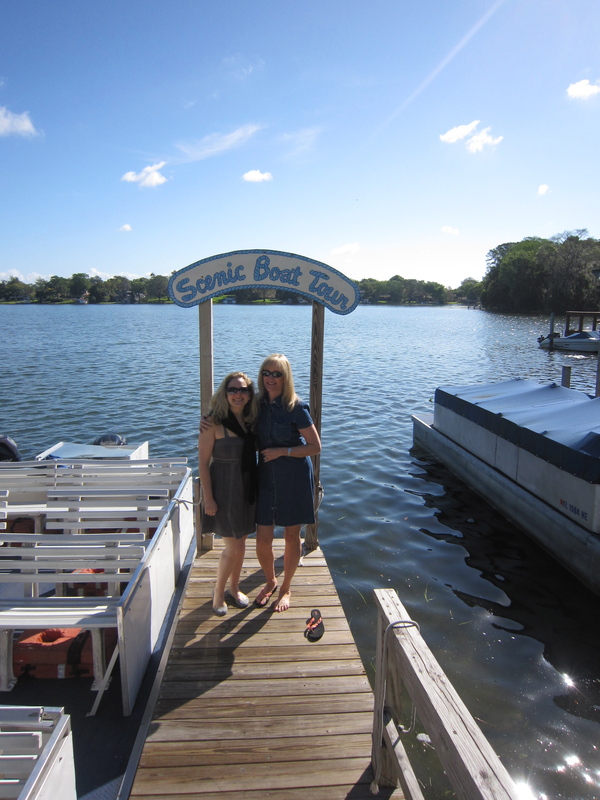 On my first day, my friend Renee and I went on a scenic boat tour around Winter Park, which is a former resort town fifteen minutes north of Orlando. I had no idea that there were such beautiful lakes and canals in Florida! I loved seeing the historic mansions around the lakes and I would definitely recommend the boat tour. After the boat ride, we went to the Mennello Museum of American Art, which is a small museum that features the work of folk artist Earl Cunningham. I liked Cunningham’s brightly colored paintings, but the museum’s sculptures and grounds especially impressed me (the museum overlooks another lovely lake). 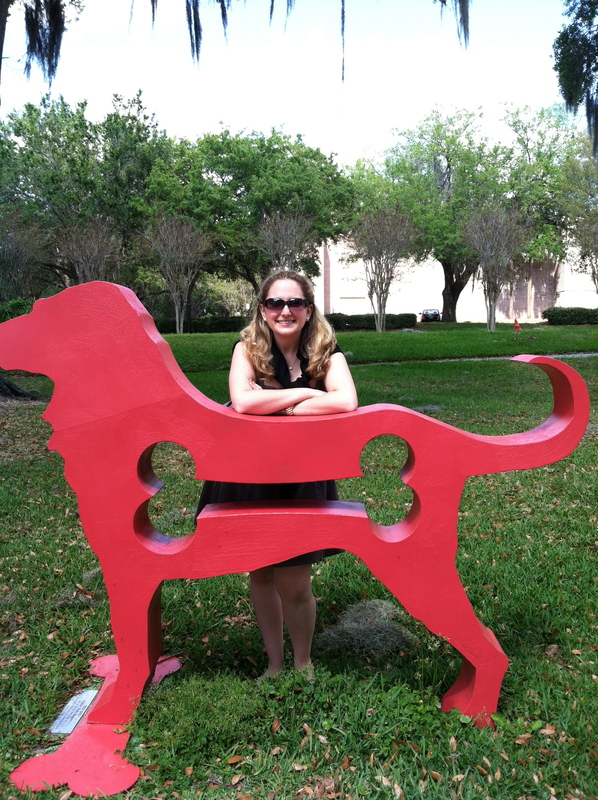 We also attended the Winter Park Sidewalk Art Festival, which is a huge outdoor arts festival that takes place one weekend a year in downtown Winter Park. It was a lot of fun walking around and visiting all of the booths (there were over 260 artists!). 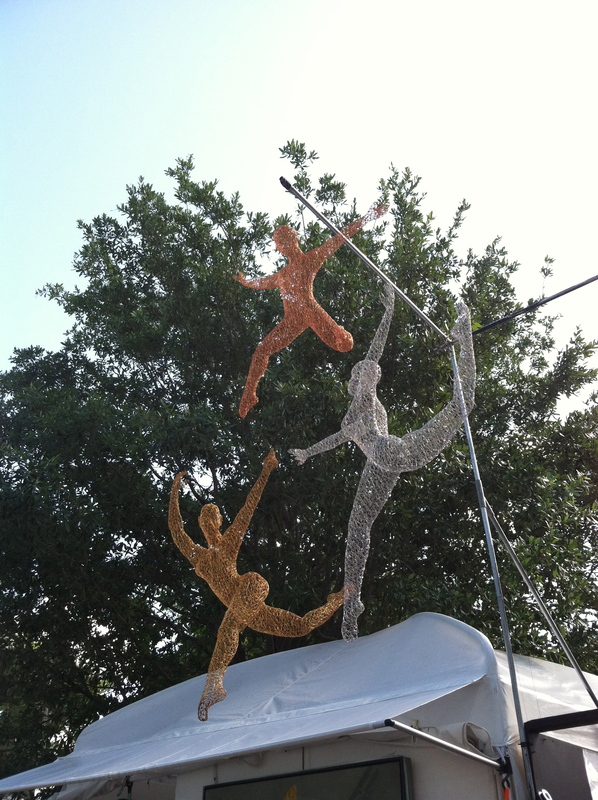 My favorite booth featured the work of Michael Gard, whose hanging wire sculptures reminded me of people dancing in the sky. We were planning on visiting the Morse Museum of Art, which has the largest collection of Louis Comfort Tiffany glass in the world, but we were exhausted from the festival. I had many memorable meals in Florida. My friends wanted to me to see a typical Central Floridian restaurant so they took me to the Southern chain restaurant, Sonny’s Bar-B-Q. 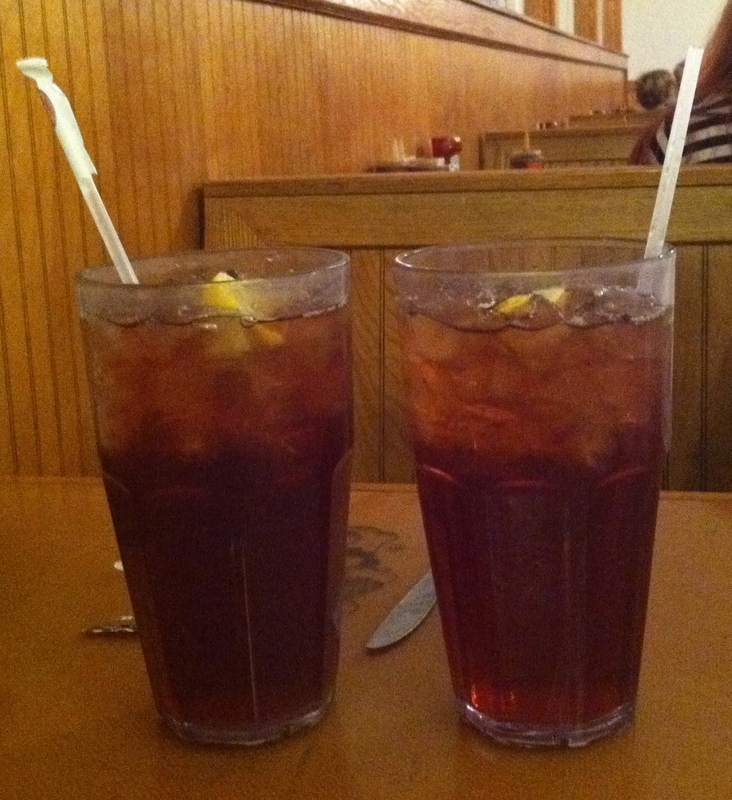 I ordered sweet tea and was brought the largest glass I have ever seen in my life! The waitress came around with refills, but the first glass had more than enough sugar for the day. They gave us to go cups to take home the excess sweet tea. 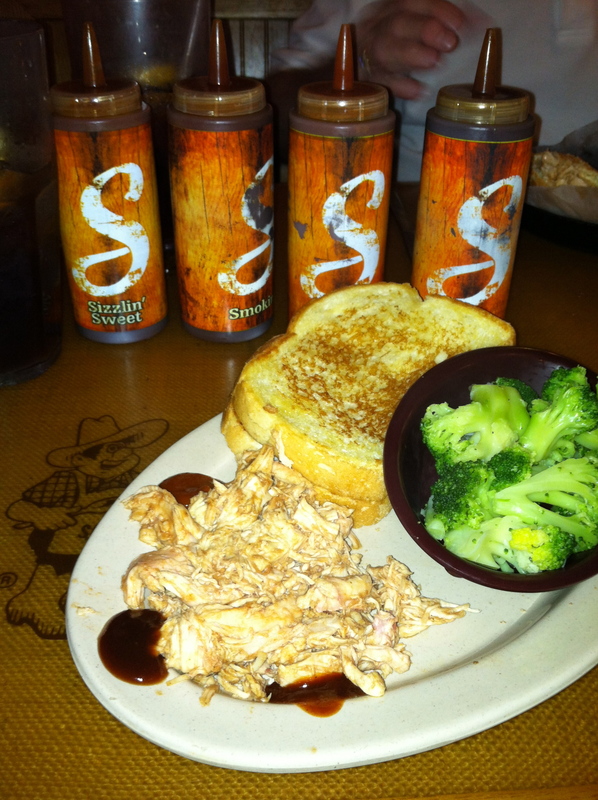 I have only been to one other BBQ restaurant in my life, but I thought the BBQ was good and I liked the variety of sauces (sizzlin’ sweet, smokin’, sweet, and mild). 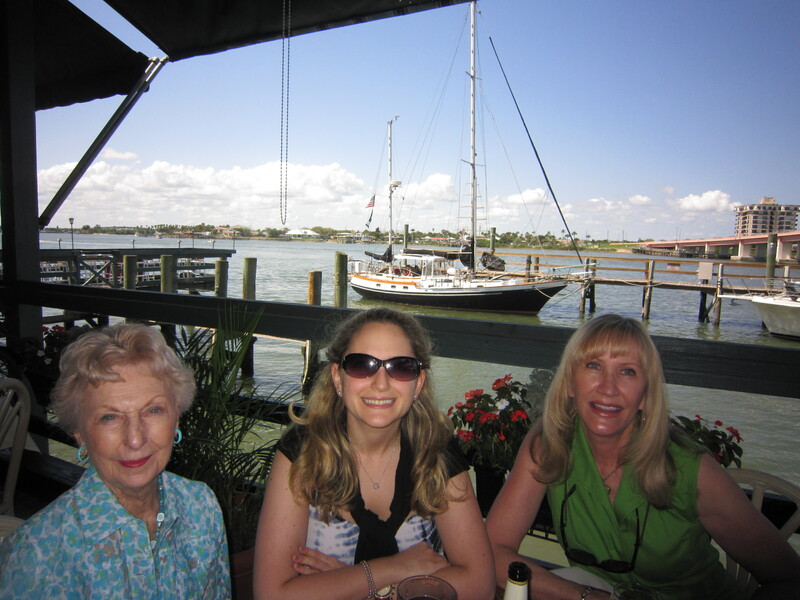 Another day we had a lovely brunch at the Grille at Riverview, which is a restaurant in New Smyrna Beach that overlooks the water. The views were stunning! The food was also very good. 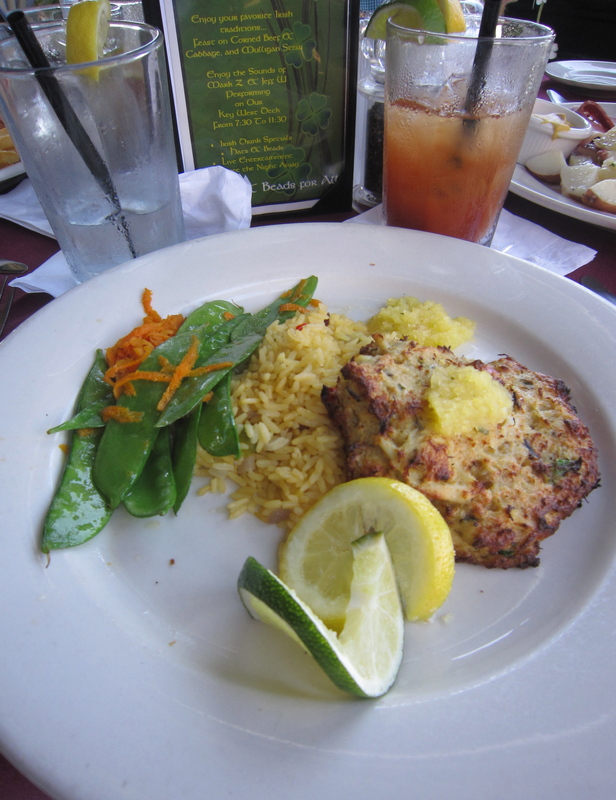 I ordered plaintain crusted crab cakes and found the portions to be very generous. I also tried my first bloody mary. Please stay tuned for part 2! Sundays in Paris are very different from NYC. Everything is closed! Well, not exactly everything (some shops in the Marais are open), but elsewhere the supermarkets, department stores, and small shops are all shut. 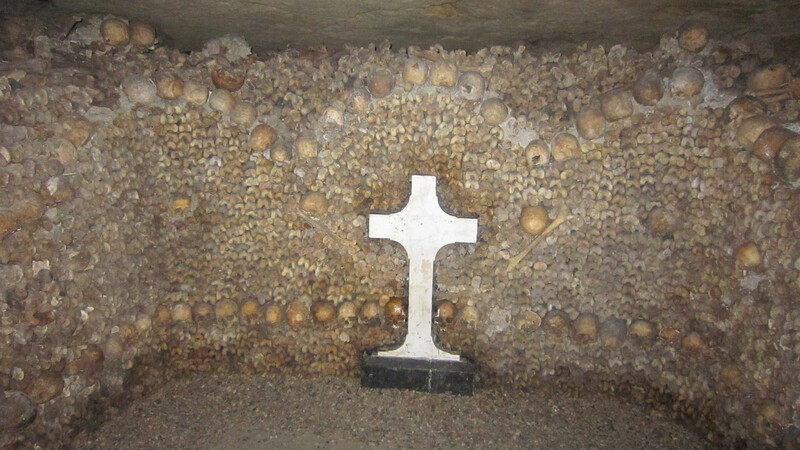 In light of the rest day, Charles and I slept very late and then headed to the Catacombs. 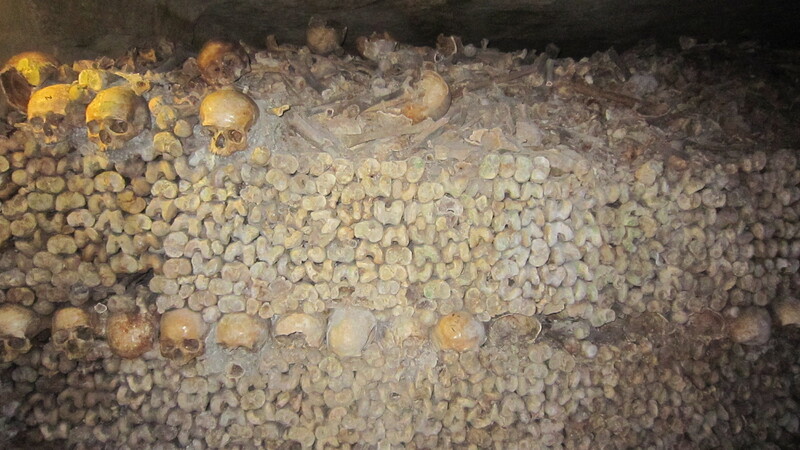 I read about the Catacombs online and thought it would be cool to visit. 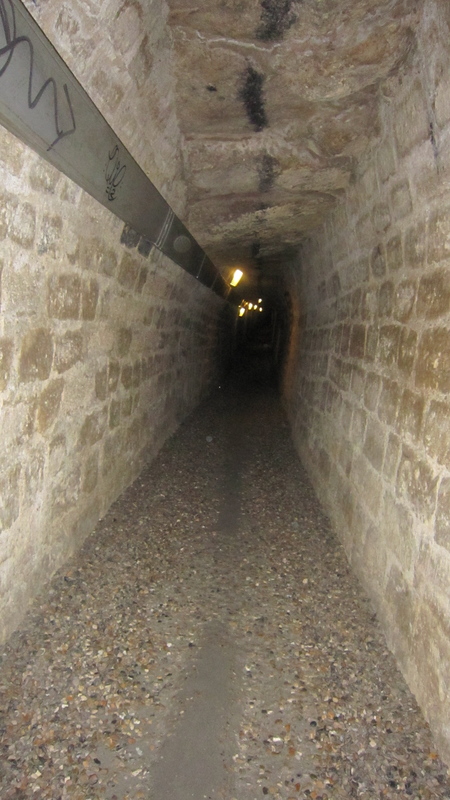 The tunnels reminded me of the border crossing scene in the movie "El Norte," but at least there were no rats. 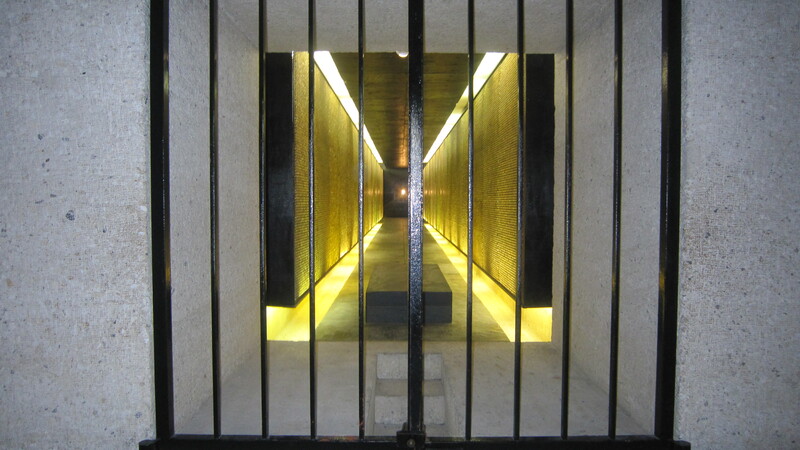 The Catacombs are a series of underground tunnels, which house the bones of six million dead people, who were transferred in the late 1700’s, when the city’s public burial grounds became overcrowded. My cousin tried to visit a few weeks earlier and said the line was over two hours. Luckily, the line was only about an hour and fifteen minutes. 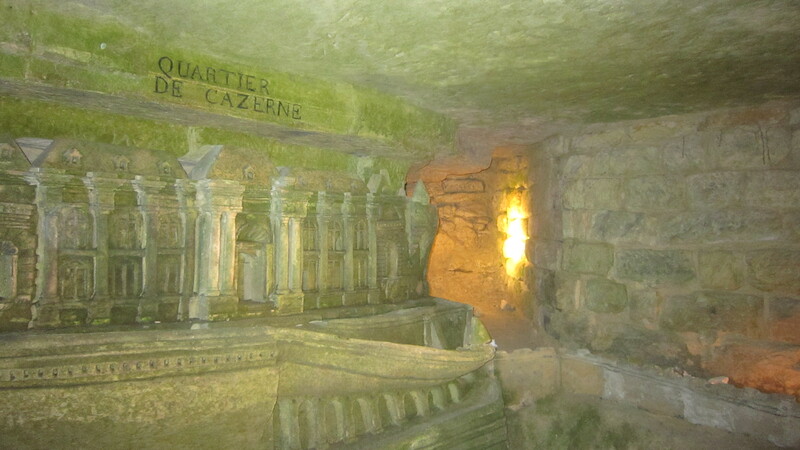 Before entering, a sign warned that the Catacombs are not for people with claustrophobia or nervous conditions. We descended down the long twisting staircase and began the self-guided tour. For the first 20 minutes of the tour, we walked through generic tunnels and saw a couple monuments to workers who died during the construction of the tunnel system. Then we reached the ossuary. Bones and skulls arranged in decorative patterns. Some of the skulls still had teeth! The ossuary was the creepiest thing I have ever seen. You can’t tell from my photos, but the rows of bones go back hundreds, if not thousands of feet and there are rooms, after rooms of bones. I have never visited a concentration camp, but the vast number of bones and the seemingly never ending rows reminded me of the Holocaust. I found it particularly strange that the bones were arranged in patterns. Although the tour was supposed to take forty-five minutes, we rushed through the oussary and finished ten minutes early. A security guard at the exit checked our bags and I saw that he was sitting with three confiscated skulls. 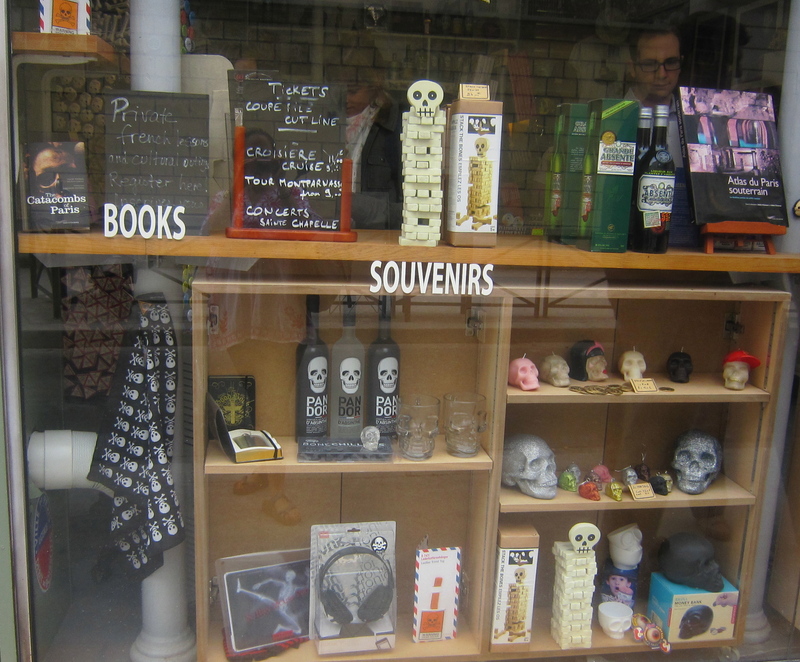 I was completely disgusted that people would steal bones and skulls! Across the street was a gift store with related memorabilia. 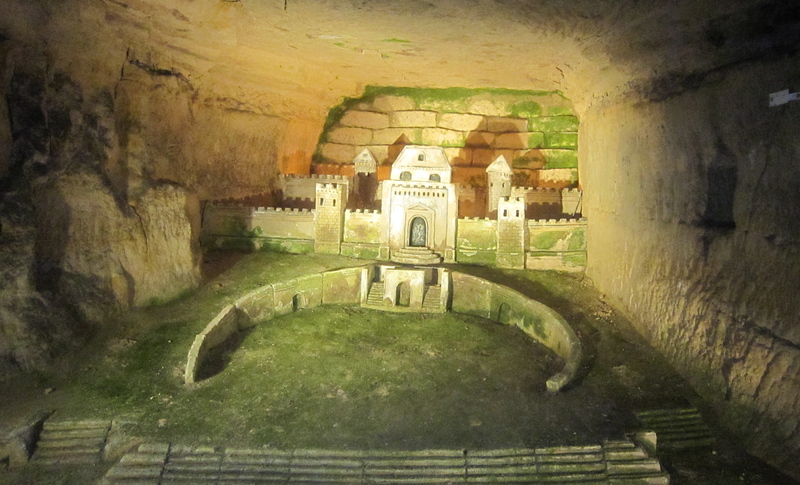 The original plan was to make a picnic for lunch, but due to our late start and the fact that the supermarkets were all closed, we ended up buying cheese sandwiches from a truck and eating in a small park near the Catacombs. 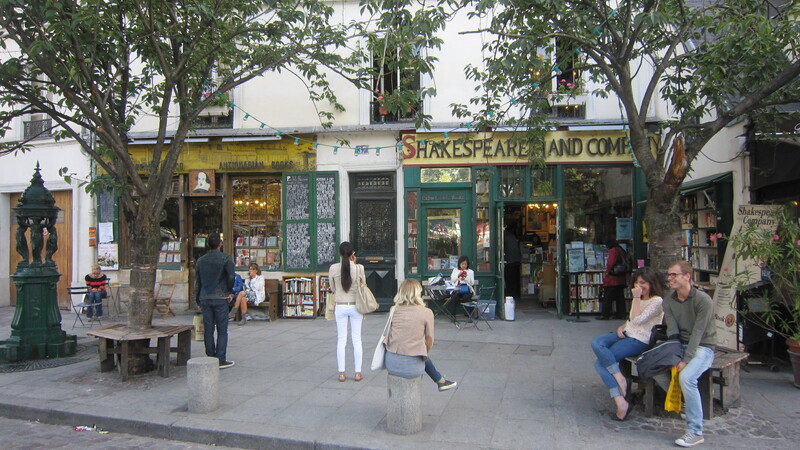 After lunch we visited Saint-Germain-des-Prés, which is a lovely neighborhood with lots of upscale shops and famous cafes, formerly frequented by existentialist philosophers. 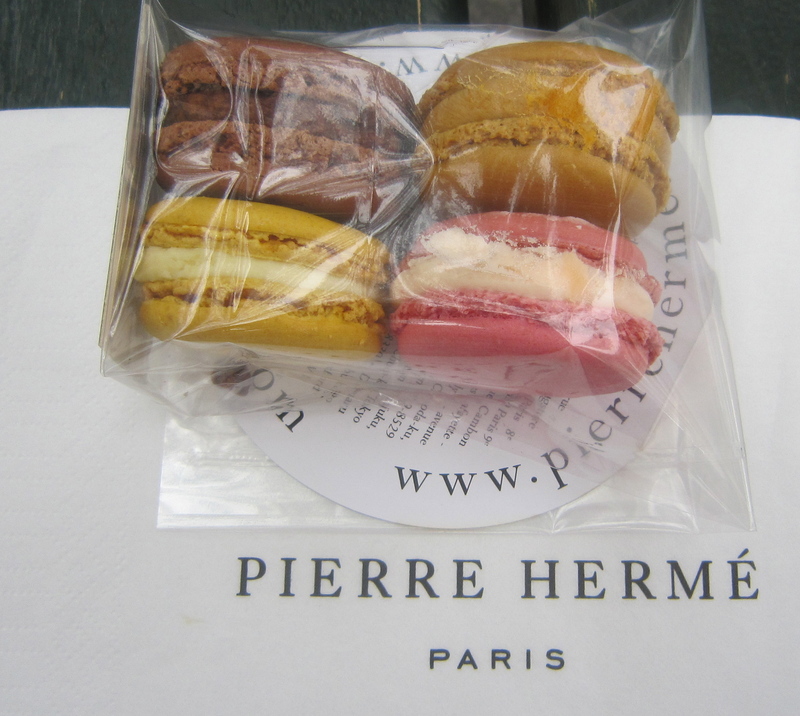 I was surprised to read in my guide book that the revered bakery, Pierre Herme was open on Sundays. I tried to visit on my last stay, but the line was ridiculous. Fortunately, this time it wasn’t too bad. Charles and I bought rose, lemon, chocolate, and carmel macaroons. We liked them all, but we both agreed that they weren’t better than Ladurée (and I prefer the interiors of the Ladurée salons). 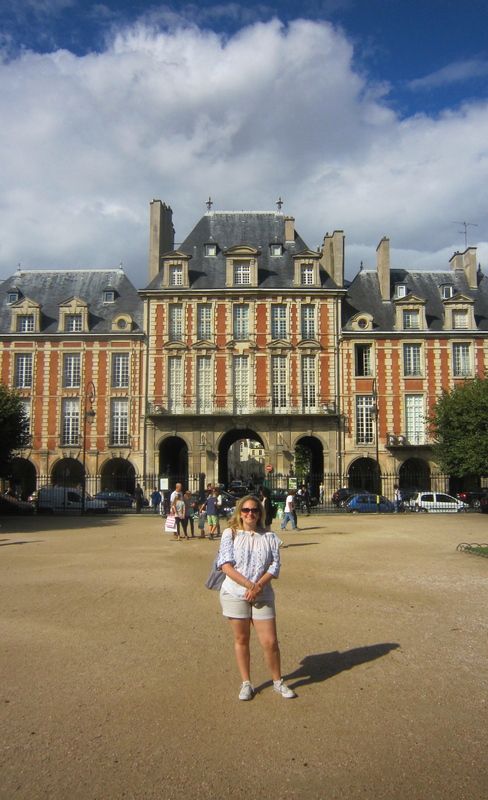 We walked around Saint-Germain-des-Prés, but almost all of the shops were closed. 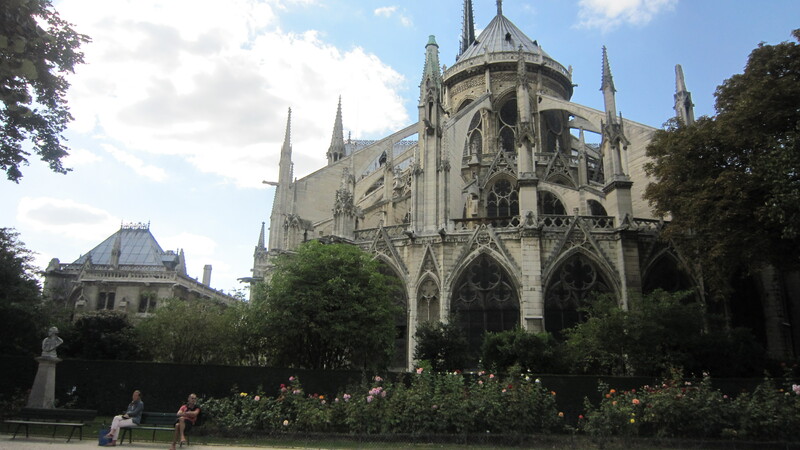 We did visit an impressive historic church and saw the cafe La Palette, where Ernest Hemingway, Jim Morrison, and Picasso used to drink (Charles made the very astute observation that it seemed like Ernest Hemingway drank in every bar in Paris). 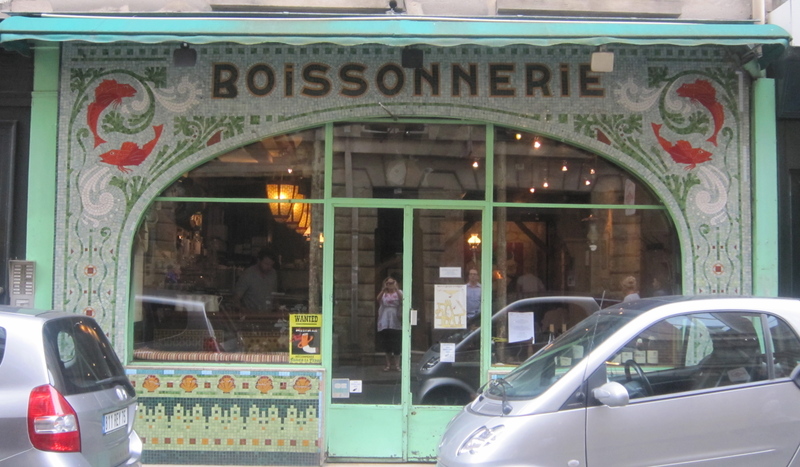 I forgot to take a photo of the cafe, but I photographed the gorgeous mosaic facade of the fish restaurant, La Boissonnerie, which we passed along the way. This photo would be prettier minus the cars. 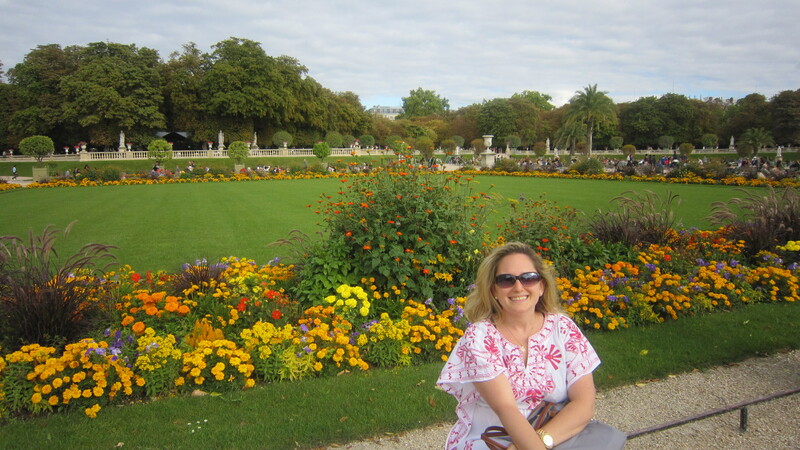 We finished the day at the Luxembourg Gardens, which is one of the largest and most beautiful parks in Paris. 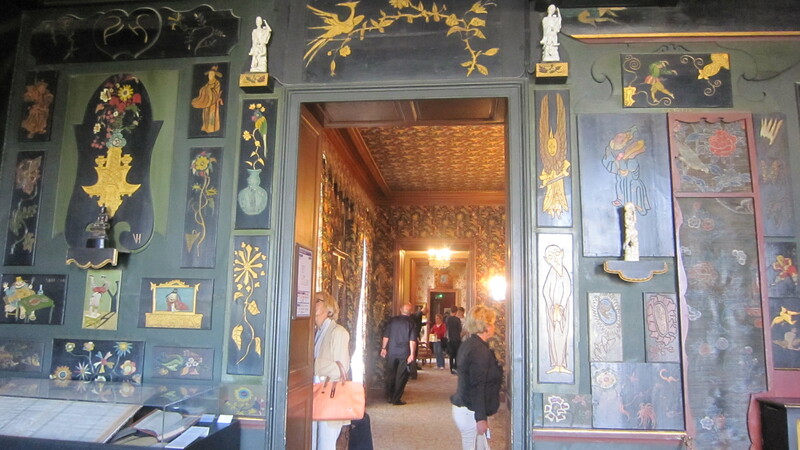 Marie de’ Medici built a palace there in the style of the Pitti Palace and it is now an art museum. I just realized that we forgot to visit the Medici fountain, but I highly recommend it. 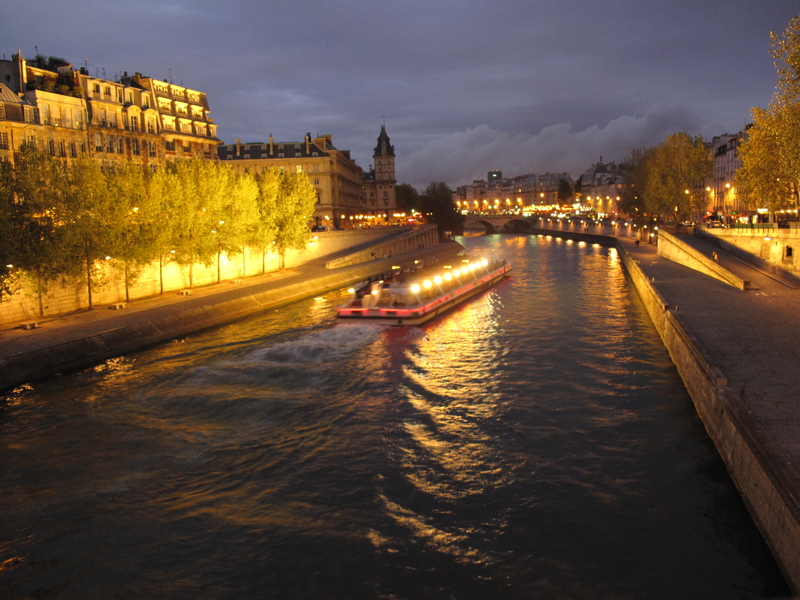 Definitely one of the most romantic places in Paris! Please stay tuned for day six! Charles and I started our fourth day at the Marche aux Puces de St-Ouen, which is Paris’ largest flea market. The walk from the subway to the flea market reminded me of Chinatown, with street vendors aggressively pushing designer copies at pedestrians. 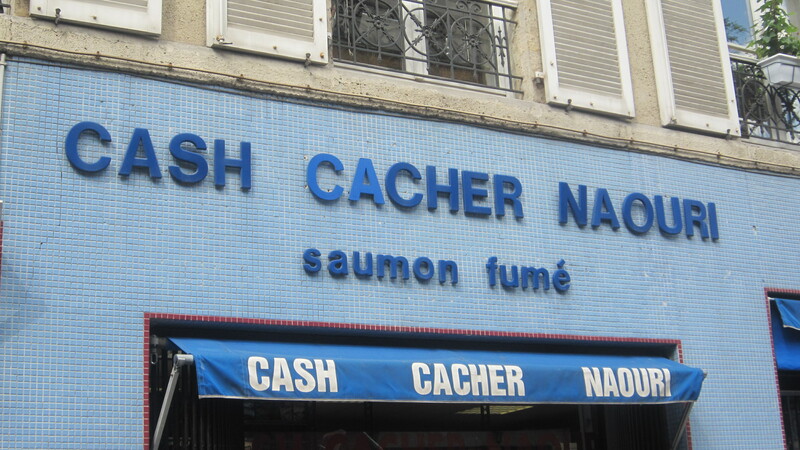 When we arrived at what we thought was the market, we saw stands selling fake American college t-shirts, Converse sneakers, and other products that you wouldn’t go to France to buy. Unfortunately, we didn’t know that the main antique market lay beyond the junk market. 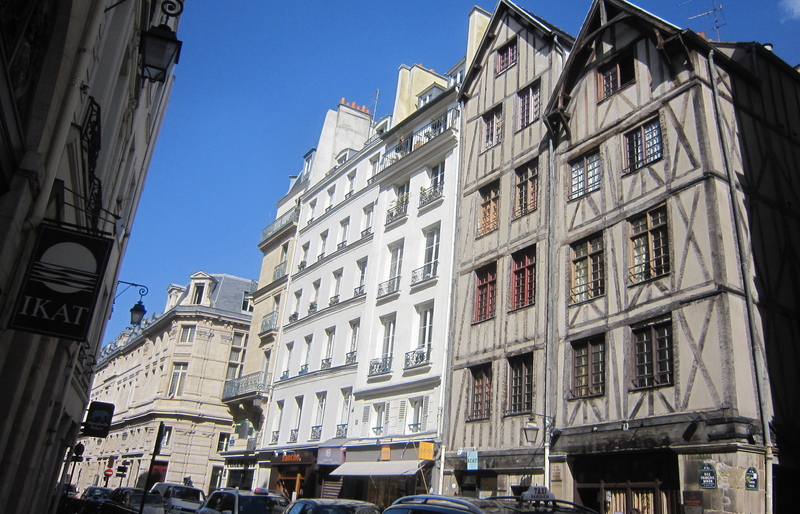 We left quickly and headed to the Marais, which is my favorite neighborhood. 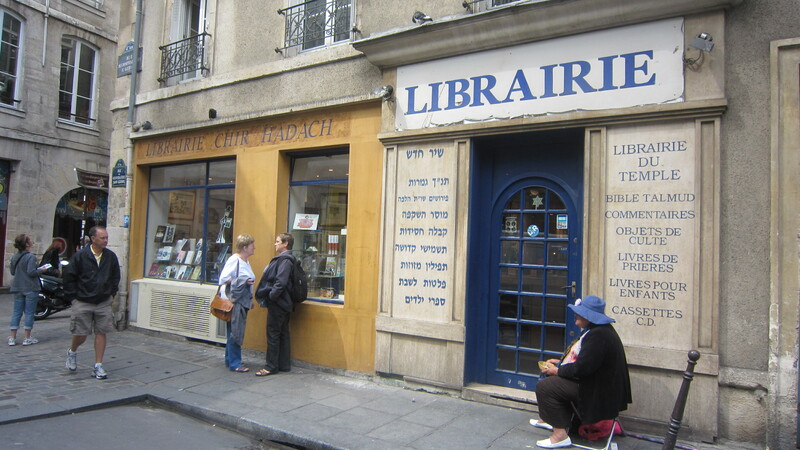 The Marais is Paris’ historically Jewish quarter and has lots of mansions, many of which are now museums. 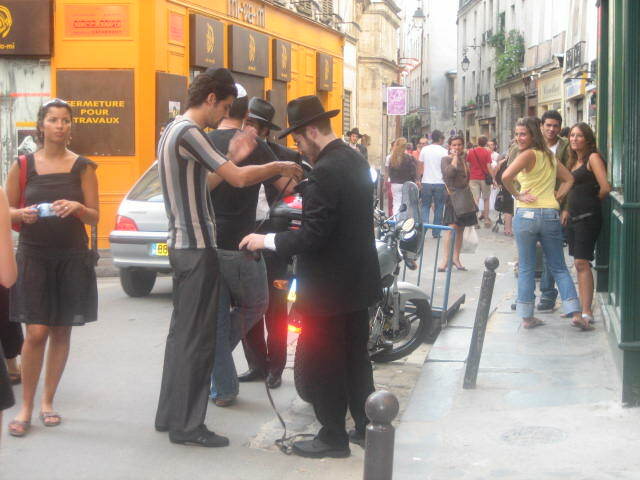 While there is still a strong Jewish presence, the area has become very trendy, with hip boutiques and bars replacing the traditional Jewish stores. It is also considered the epicenter of the city’s gay community. 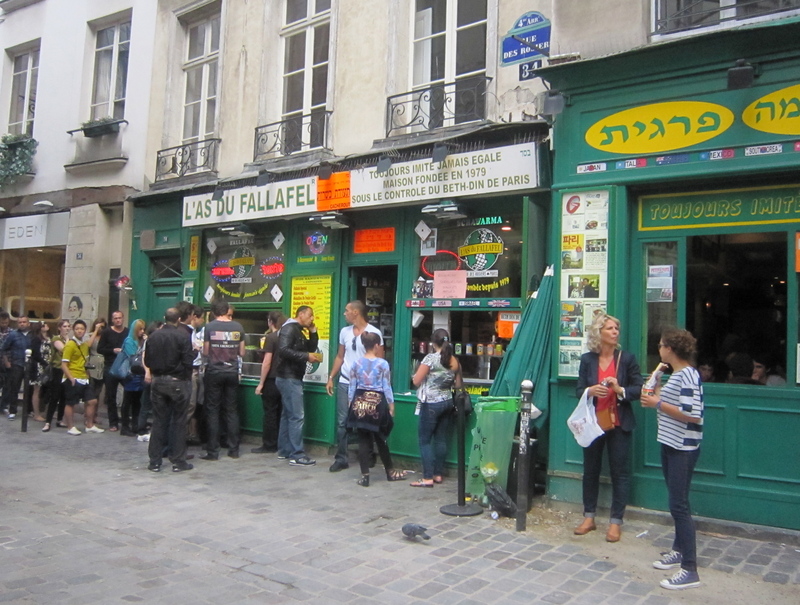 The Rue de Rosiers is home to the neighborhood’s remaining Jewish stores and many falafel restaurants, the most famous of which is L’As du Falafel. I thought the falafel restaurants were more cultural than religious, but apparently I was wrong because all but two were closed for Shabbat. After a forty-five minute wait, we got take out at Chez Marianne. Despite not being one of the recommended restaurants, the falafel was delicious! 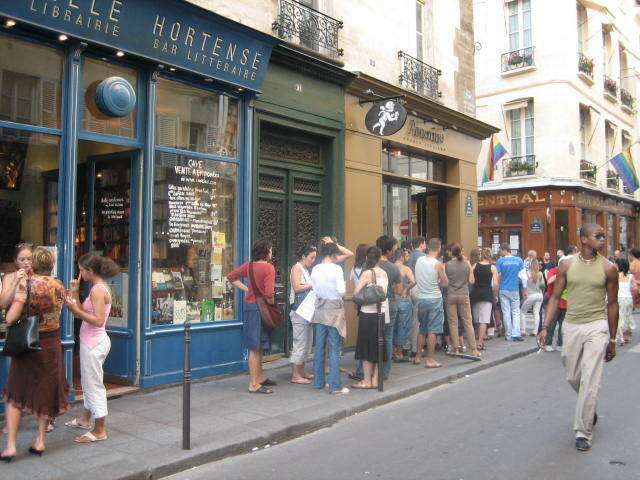 Tourists eating falafel in front of Chez Marianne. I forgot to take a photo of mine, so this will have to do, but it didn't look much different than falafel in NYC anyway. 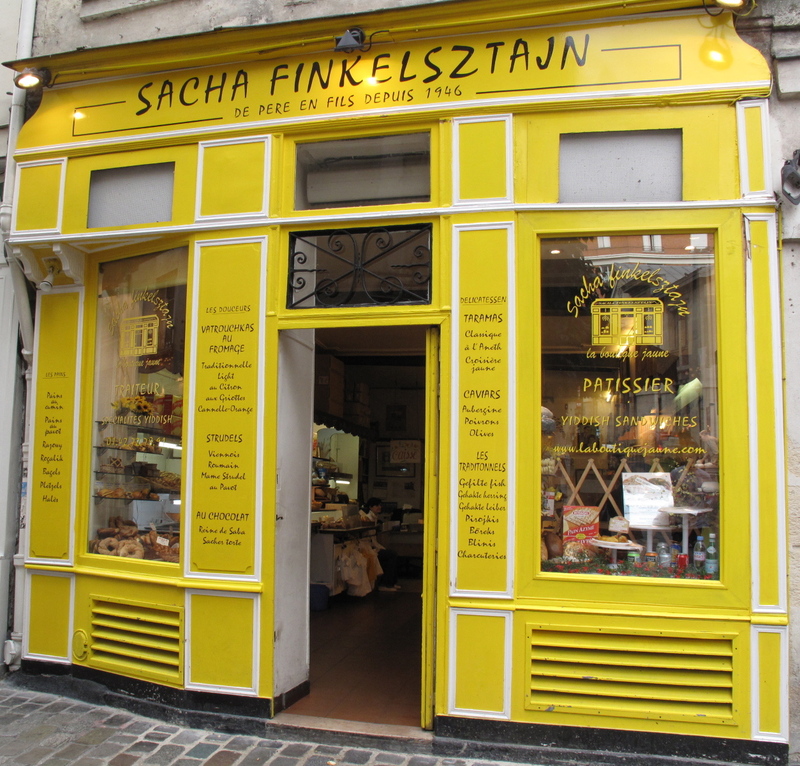 We bought dessert at Sacha Finkelsztajn across the street, which is a third generation run Jewish bakery. In general, the pastries at the traditional Jewish bakeries in Paris fascinated me because the specialties were so different from traditional Jewish bakeries in the U.S. 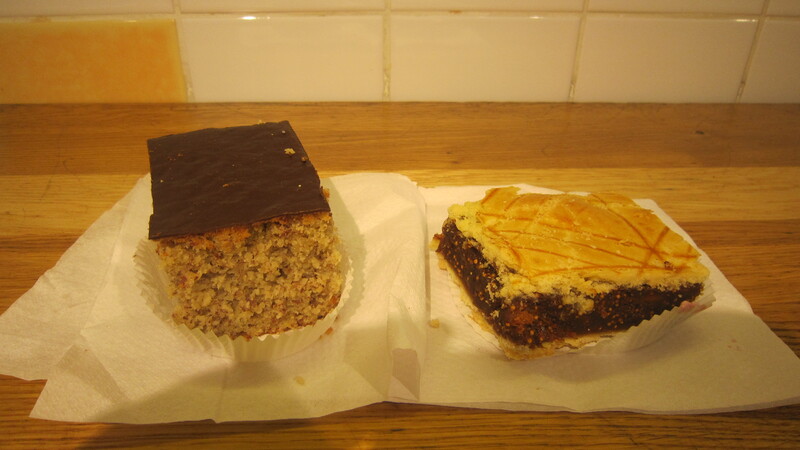 The Jewish bakeries in Marais all had square cake slices in their windows, which came in the following flavors: cheesecake, apple cake, poppy seed cake, and date cake. 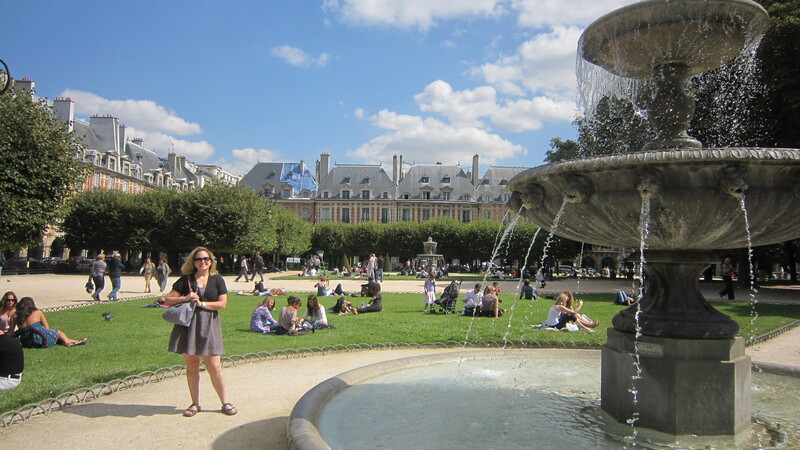 We walked through the park in the center of the square and then visited Musée Carnavelet, which is a free museum dedicated to the history of the Paris. 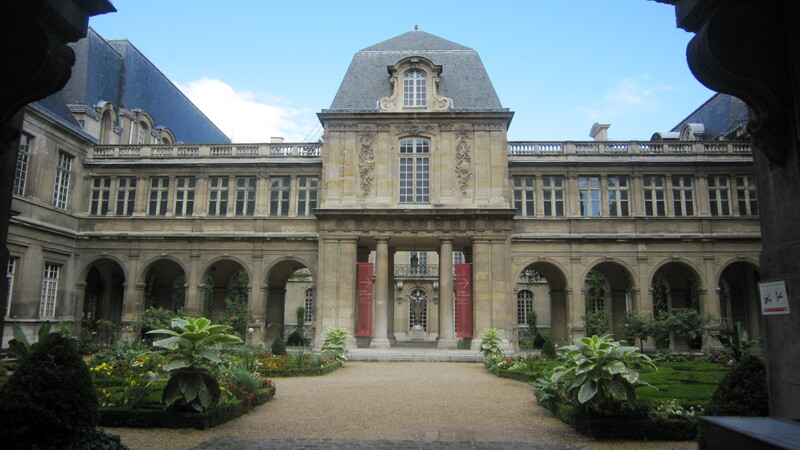 The museum is definitely one of the best free cultural sites in Paris. 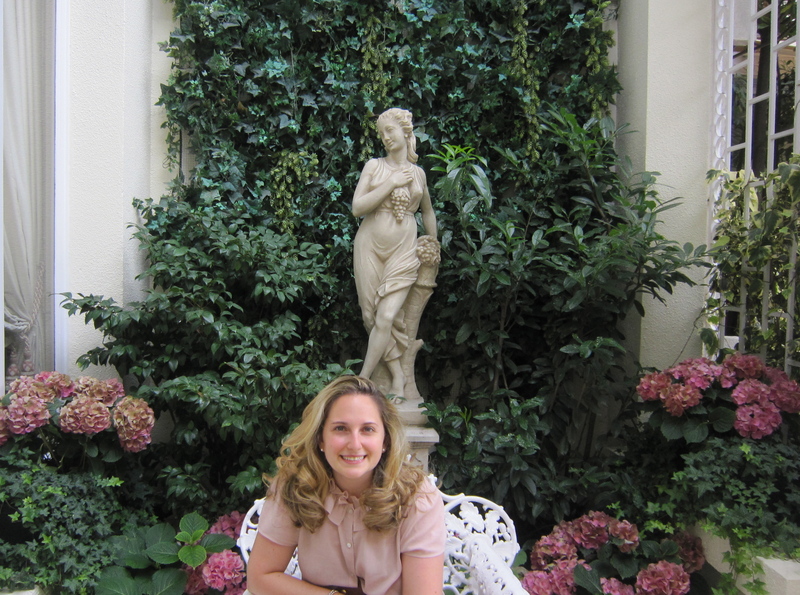 The museum is housed in two neighboring mansions and has a lovely courtyard. 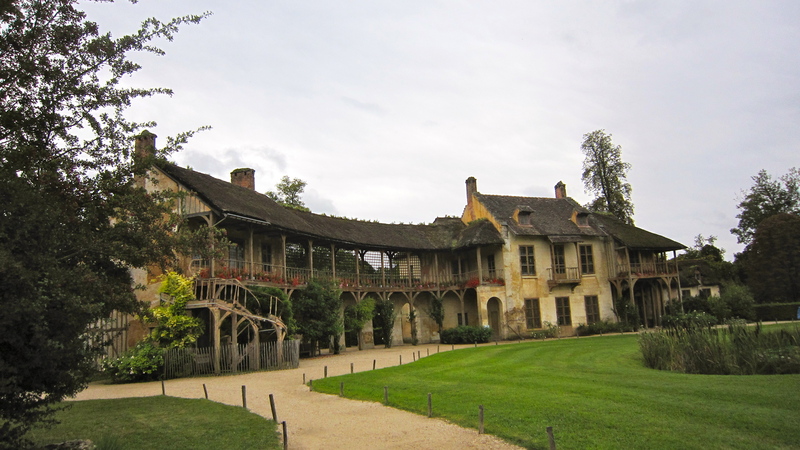 The main attractions at the museum are the painting collection and the fabulous period rooms, which include an art nouveau bar and Marcel Proust’s bedroom. We covered the museum and then walked two blocks to the Musée Cognac-Jay, another interesting free museum. The Cognac-Jay is also housed in a former mansion and features the eighteenth century art collection of the owners of the now closed Samaritaine department store. The paintings are nice and the price is right, but I would more strongly recommend the Musée Nissim de Camondo if you are an affectionado of the eighteenth century (the Camondo home is better furnished). The Cognac-Jay has a cute garden, but it was raining, so we skipped it. 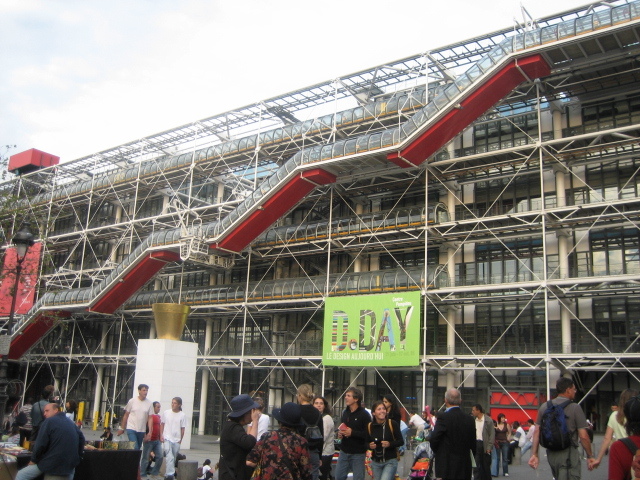 I wanted to show Charles the free Atelier Brancusi at the Pompidou Center (the modern art museum AKA Beaubourg), but unfortunately it started pouring and was closed by the time we arrived. 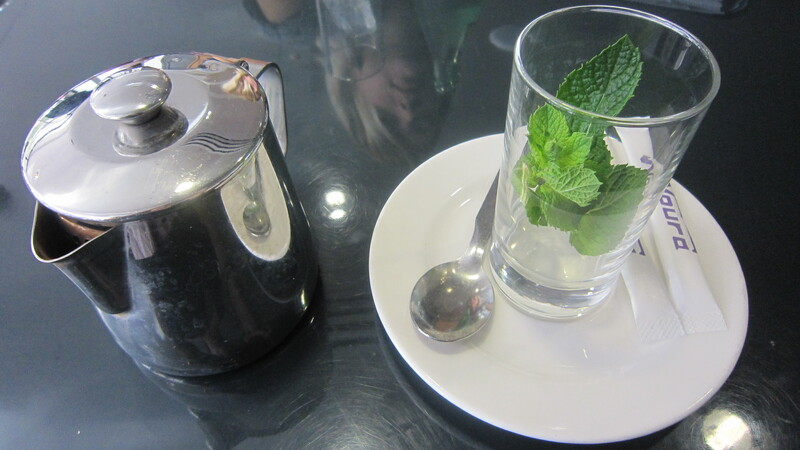 We got tea in a café while waiting for the rain to subside and then headed home to change for dinner. 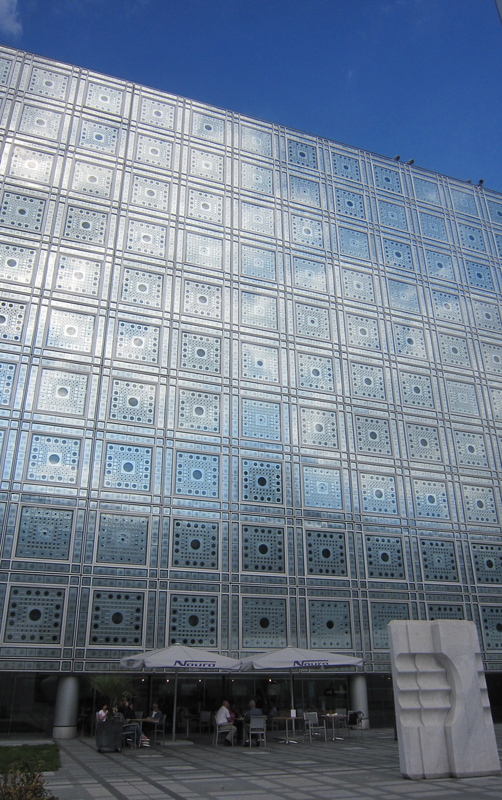 The exterior of the Pompidou Center is cool, but kind of ugly (the building's functional elements are on the outside). This is an old photo, taken on a day with less inclement weather. 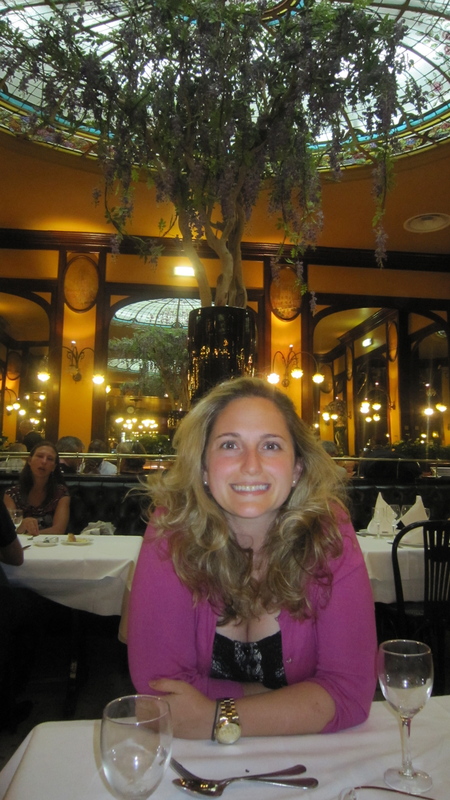 Charles wanted to have a fancy night out, so we decided upon Brasserie Bofinger, which is one of my favorite restaurants in Paris. 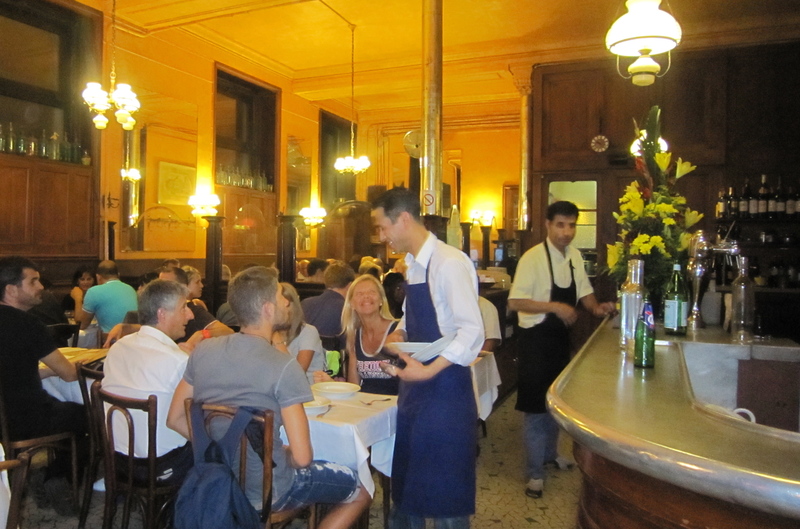 Brasserie Bofinger specializes in seafood and has a historic art nouveau interior. 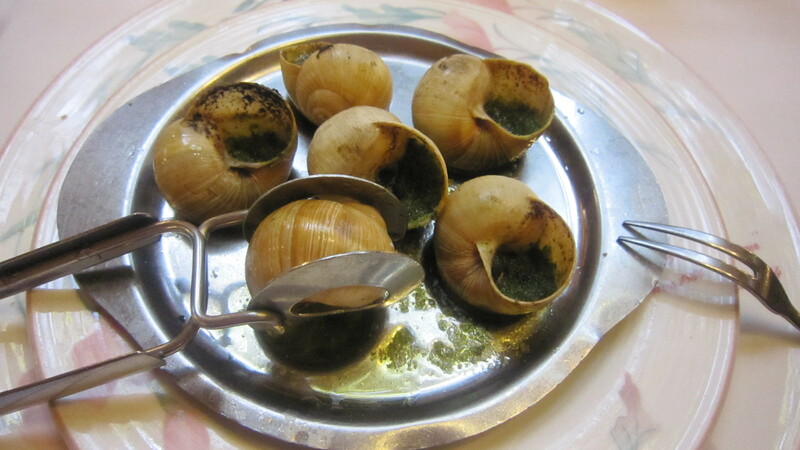 I ordered two appetizers instead of an entrée, escargot and salmon tartare. I also got a kir (crème de cassis + white wine), which became the official drink of the trip, because “when in Rome, do as the Romans do.” Everything was excellent and I felt very lucky that we were able to sit under the famous glass doomed ceiling in the central dining room, without even having a reservation. 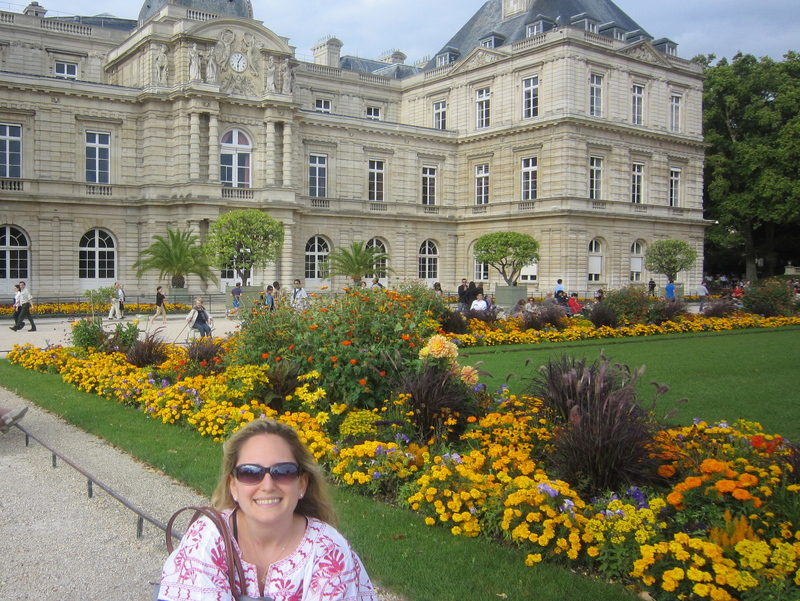 Please check back Friday for the next installment in my Paris series, which includes a tour of the super creepy catacombs and a visit to the beautiful Luxembourg Gardens. 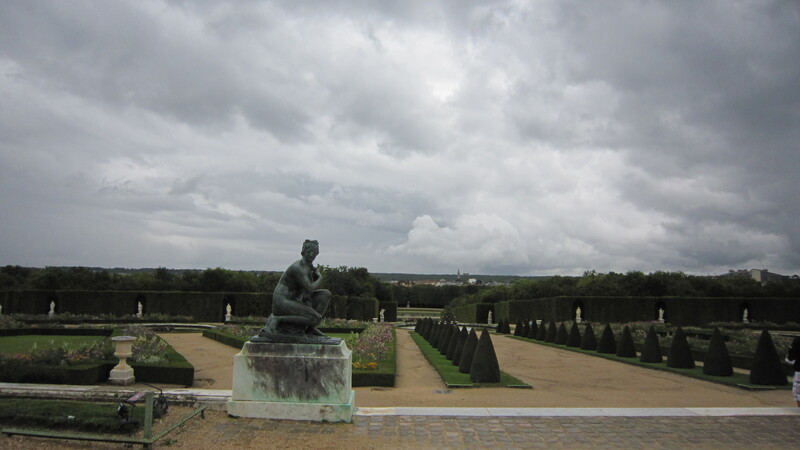 For our third day in France, we ventured outside Paris to a destination a mere 35 minutes away: VERSAILLES! 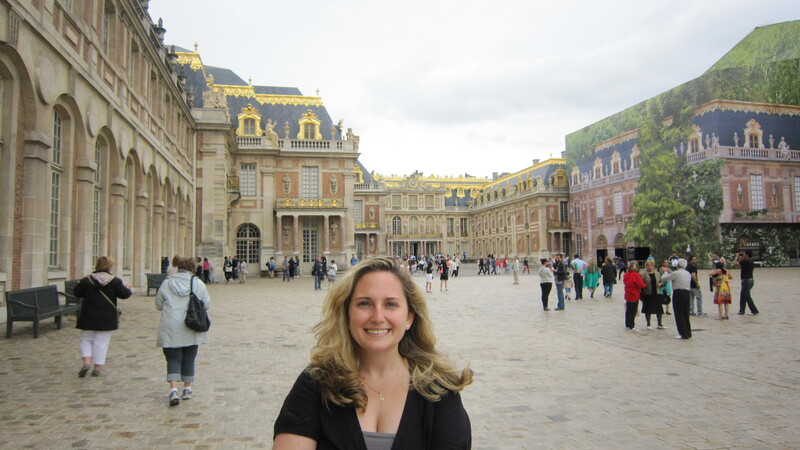 This was my fourth time visiting Versailles, but it was still one of my favorite days of the trip and I saw several sites I hadn’t seen before. 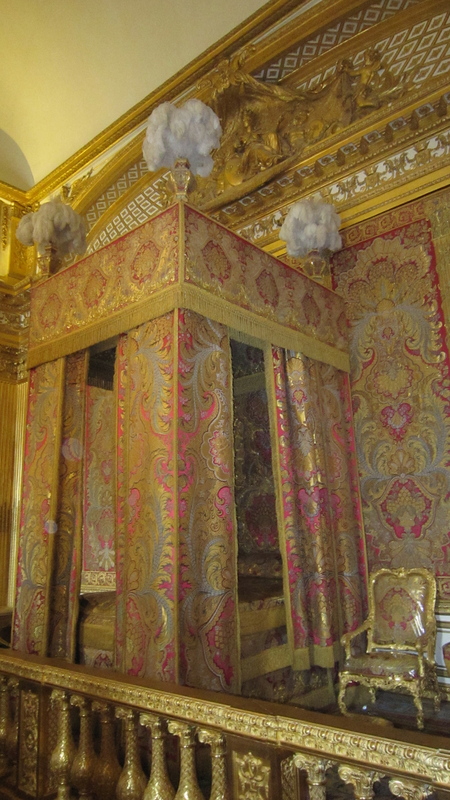 We took the RER train and then walked about fifteen minutes through the cute town of Versailles to reach the chateau. After waiting on a long line, we bought “passport” tickets, which gave us access to all of the buildings on the property for 18 Euros. We started at the main chateau. The king and queen’s private apartments are only accessible by guided tour, but the passport ticket allowed us to walk through numerous staterooms and the king and queen’s magnificent bedrooms. 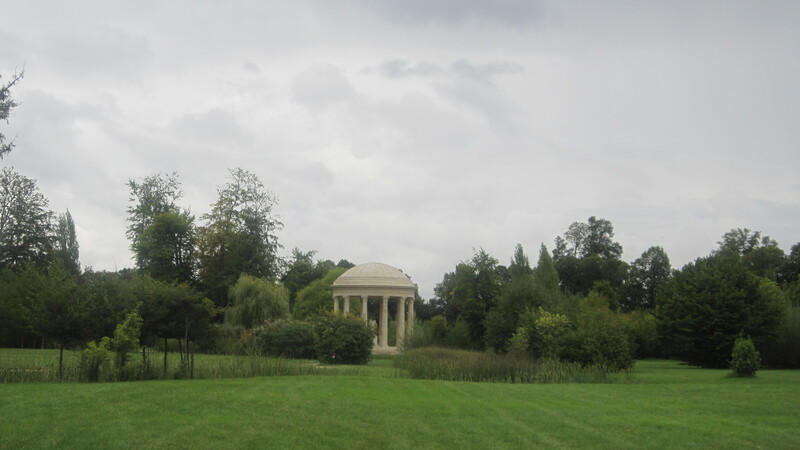 We opted against the guided tour because we wanted to visit other properties on the estate. After touring the chateau, we had a nondescript lunch in the cafeteria and then bought tickets for the trolley to tour the rest of the estate. It would have been nice to walk from building to building and enjoy the gardens, but the weather was rainy and cold at that point. 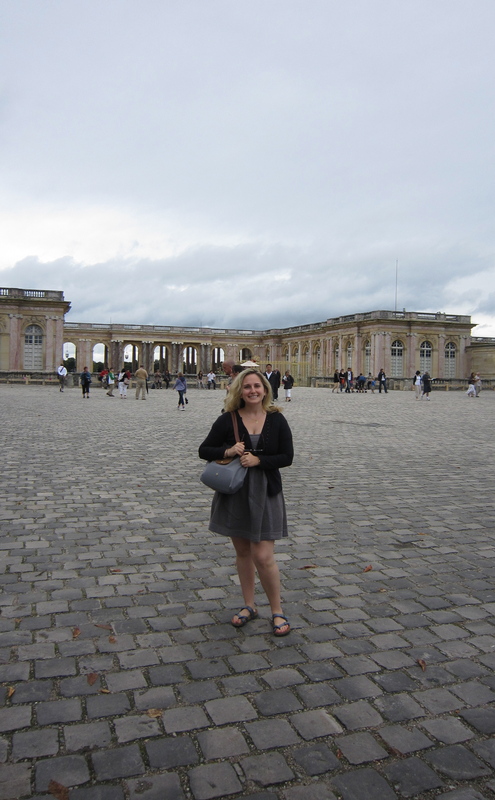 Our first stop was the Grand Trianon, which is a smaller chateau on the estate that was built by Louis XIV for his mistress. This was one of my favorite stops, since there was a fashion exhibit in the space, co-sponsored by Versailles and the Musée Galliera (a fashion museum in Paris). Throughout the beautifully decorated palace, mannequins wearing clothes by avant garde designers like Vivienne Westwood and Alexander McQueen were juxtaposed next to the 18th century wears that inspired them. Unfortunately no photography was allowed inside, so I couldn’t capture the cool exhibit. 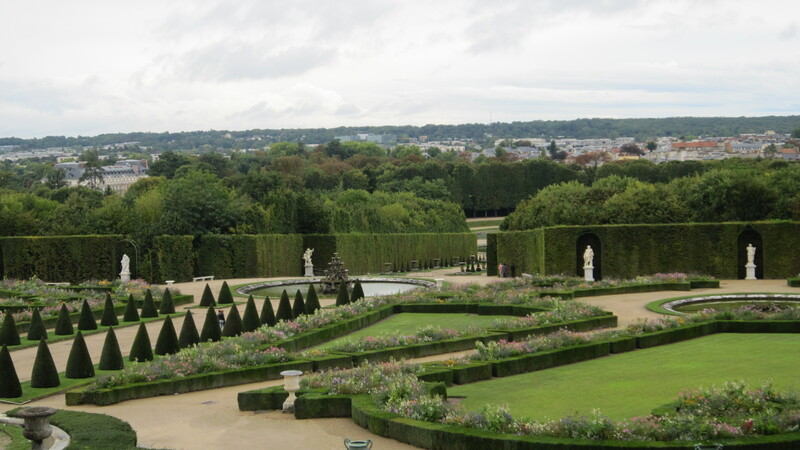 After the Grand Trianon, we took the trolley to the Petit Trianon, which is another chateau on the property. 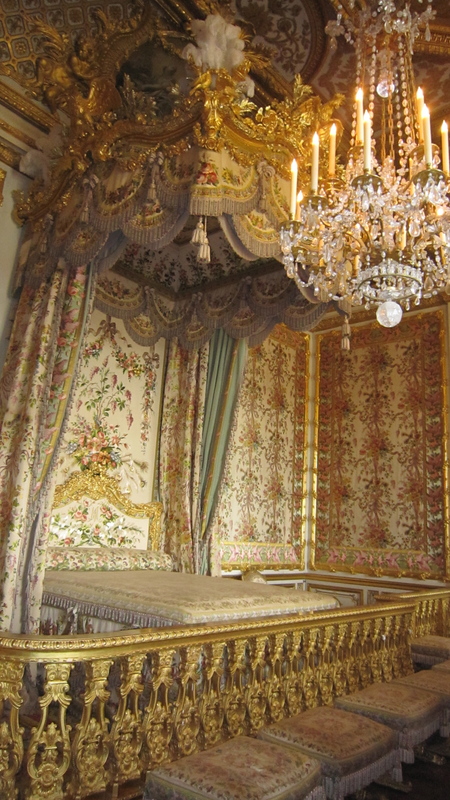 Louis XV built the Petit Trianon for his mistress, Madame de Pompadour. Louis XVI later gave the Petit Trianon to Marie Antoinette, who went there to escape the “pressures” of court life. 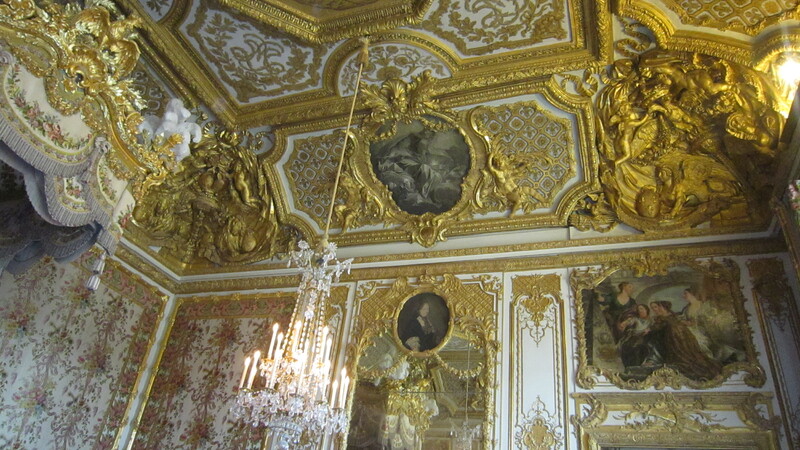 The house was less ornate than the main chateau, but closer to how I would personally want to decorate my home. We were excited to see an outpost of Angelina’s tea house and ordered two cups of the famous hot chocolate (there were also outposts of Laduree and Angelina’s at the main chateau, which I don’t remember seeing on past visits). By that point it had stopped raining so we enjoyed the hot chocolate on the terrace outside. It was a nice pick-me-up, but was a little too pudding-like to get my vote for best French hot chocolate. 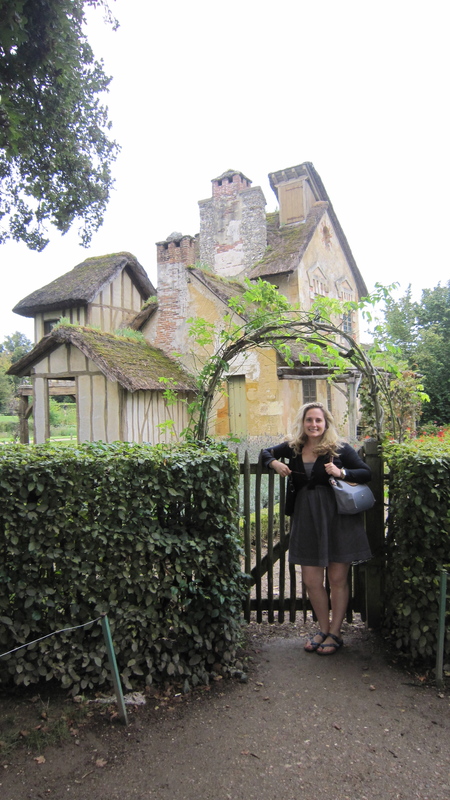 Following Angelina’s, we walked through the gardens adjacent to the Petit Trianon and reached the Hameau de la Reine (Queen’s Hamlet). 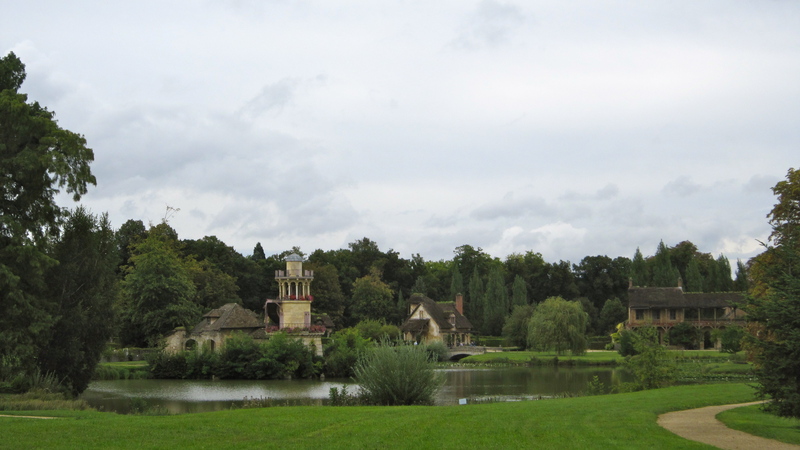 Despite having been to Versailles multiple times, I had never been to the Hameau before because it only opened to the public in the early 2000s and it’s a bit of a walk from the main chateau. The Hameau is now my favorite part of the estate! 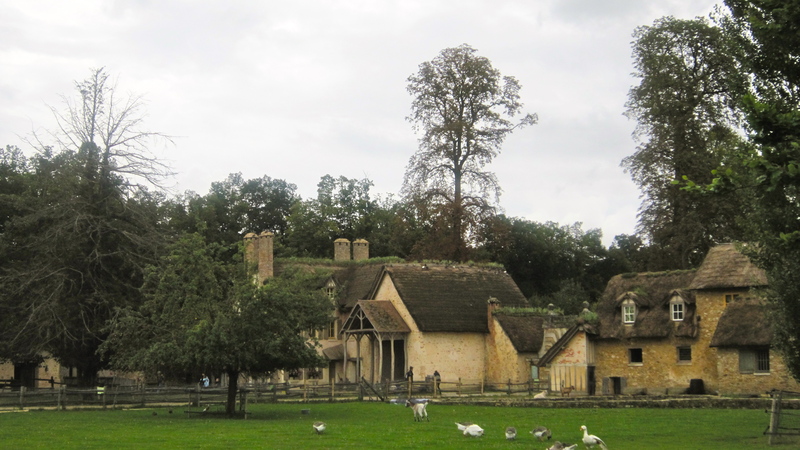 The Hameau consists of twelve farmhouses that were built for Marie Antoinette, who enjoyed dressing up and pretending to be a farmer in her leisure time (though a real farmer’s family maintained the working farm at that time). 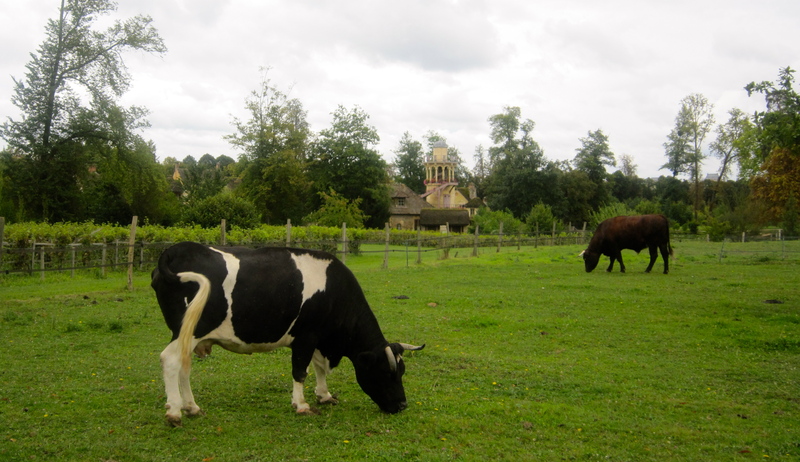 Today the Hameau is an animal refuge and petting zoo. It’s also the most bucolic and serene place I’ve ever seen! The only thing that disappointed me was that the buildings weren’t open to the public. The last trolley stop was the canal, but we didn’t get off because we were tired and it was late. When we arrived back in Paris, we selected Bistrot Victoires for dinner, aptly described in my Time Out guide as a traditional French brasserie with budget prices. 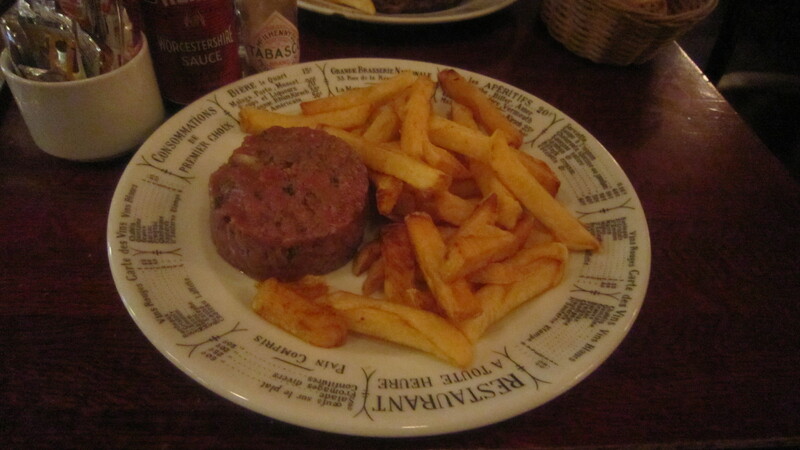 I ordered steak tartar, which came with the traditional accompaniment of French fries. I don’t order fries a lot for health reasons, but they were delicious! After dinner we went for a nightcap at the Café de la Paix, which is a historic café (c. 1862) located across from the famous Palais Garnier Opera House. I ordered kir, a traditional French aperitif consisting of crème de cassis(blackcurrant liqueur) and white wine. 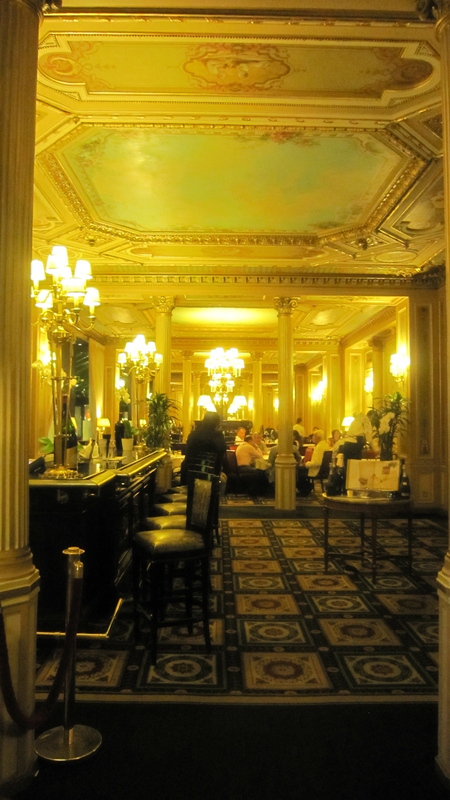 The prices at Café de la Paix were dear, but well worth it for the opulent atmosphere (and one drink never broke the bank!). 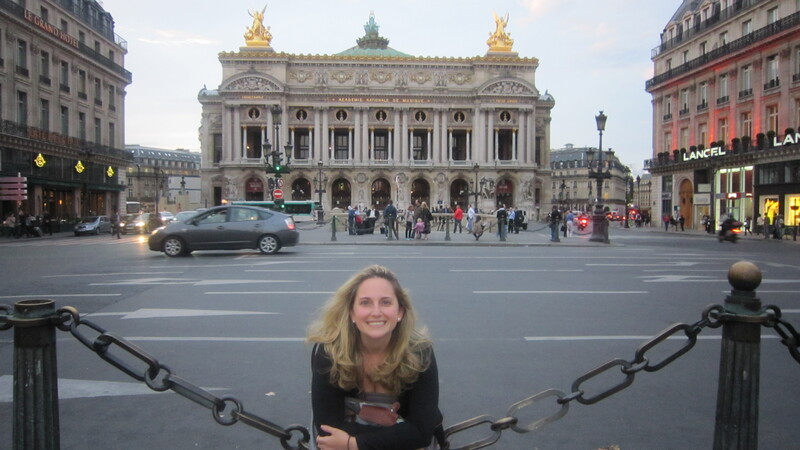 Sitting outside the Palais Garnier Opera House, one of the most beautiful buildings in Paris! 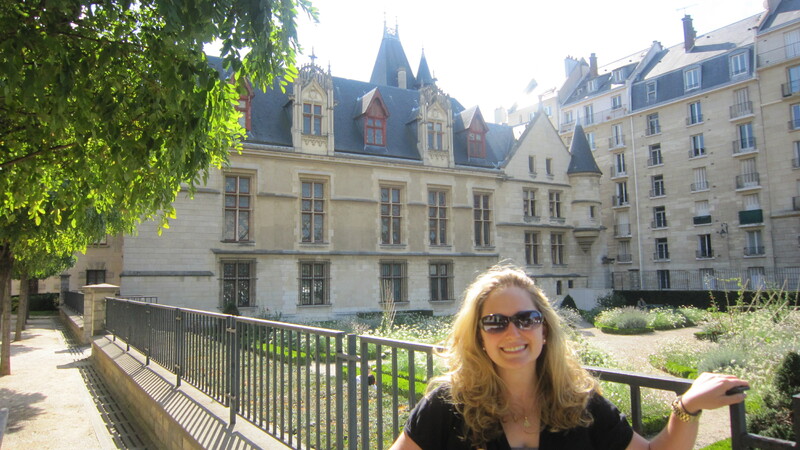 Please check back on Friday for day 4 of my Paris series, in which I visit my favorite neighborhood, the Marais! 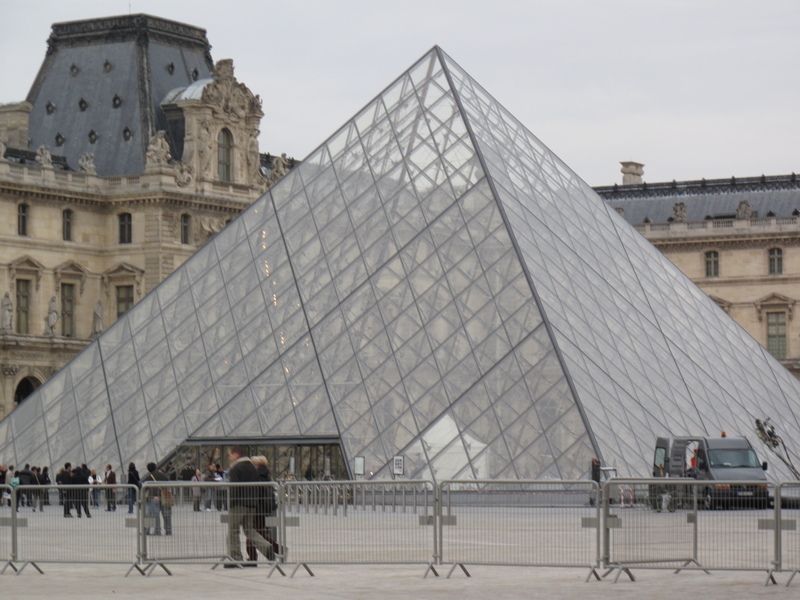 For our second day in Paris, we only had one cultural activity on the agenda, the Louvre. 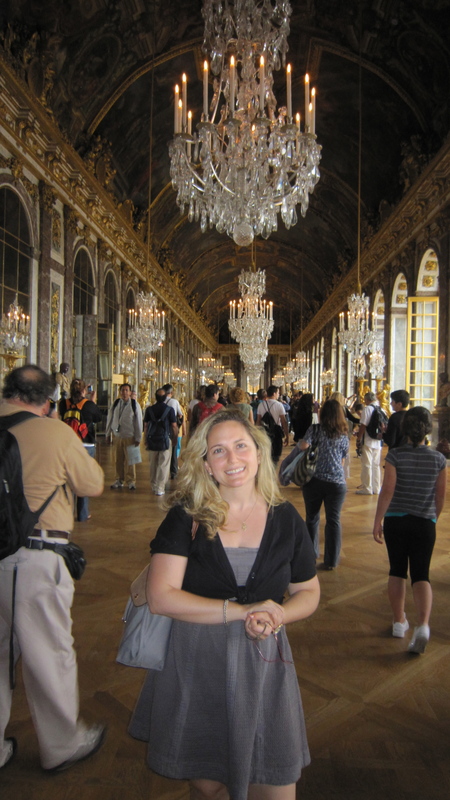 Since we had both seen the great art trifecta on previous visits (the Mona Lisa, Winged Victory, and Venus de Milo), our only objectives were to visit the newly renovated Greek rooms (Charles’ pick) and Napoleon’s apartment (my pick). We got very lost trying to find both, but we didn’t mind because exploring the museum was the main idea. 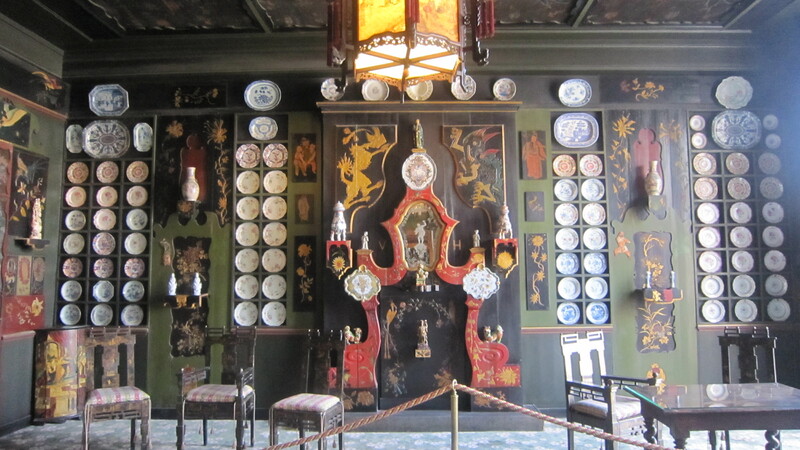 All of the rooms were magnificent! After several hours of wandering around, we were very ready for lunch. 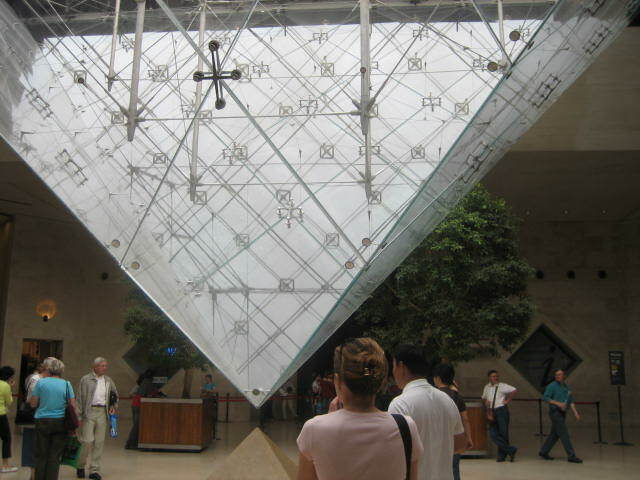 We settled upon the Louvre’s international food court for a fast and semi-reasonably priced meal. 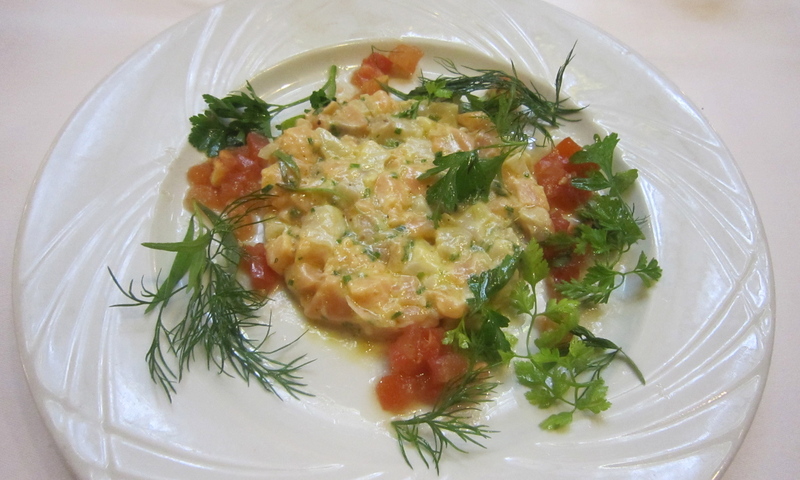 I ordered from the French station, since we were in France and French food is one of my favorite cuisines. This meal was not super exciting, but it served its purpose and the mini bottle of olive oil/vinegar dressing was adorable. Following our late lunch, we visited the mall under the Louvre, stopping at the Mac store to check an address online, and of course visiting the museum gift store. 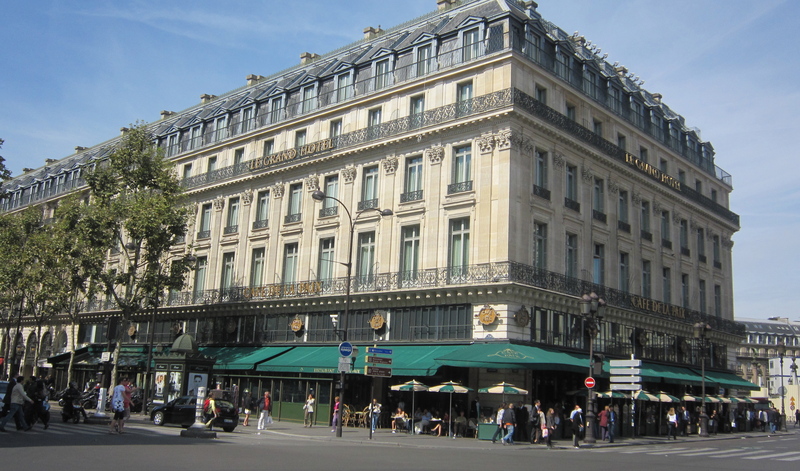 We left the Louvre and walked along the parallel Rue de Rivoli, where I showed Charles Angelina’s tea salon and the Philippe Starck renovated Maurice Hotel. 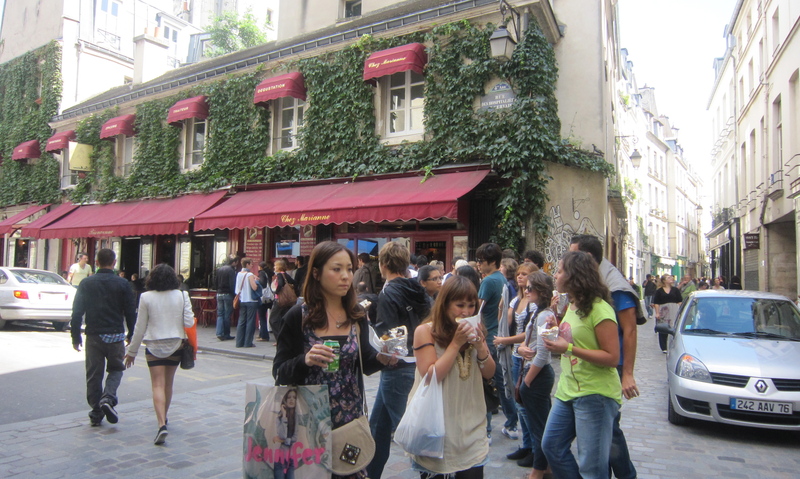 We then switched over to the Rue du Faubourg Saint-Honoré, which has very fashionable shops and great people watching. Our first stop was Colette, the original concept store and the coolest shop I’ve ever seen (concept stores are trendy lifestyle stores that sell everything from clothing to music, books, perfume, candles, the latest high tech gadgets, etc…). I was excited to see the new Beirut album among the selection of highly curated CDs. Colette buyers have good taste. 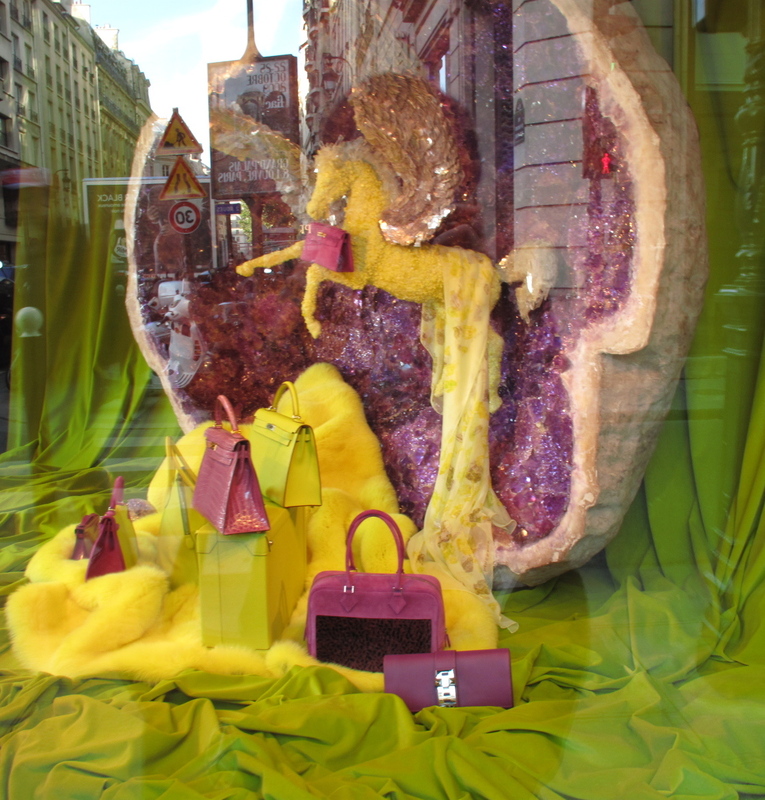 Our next stop was the Hermes flagship store. 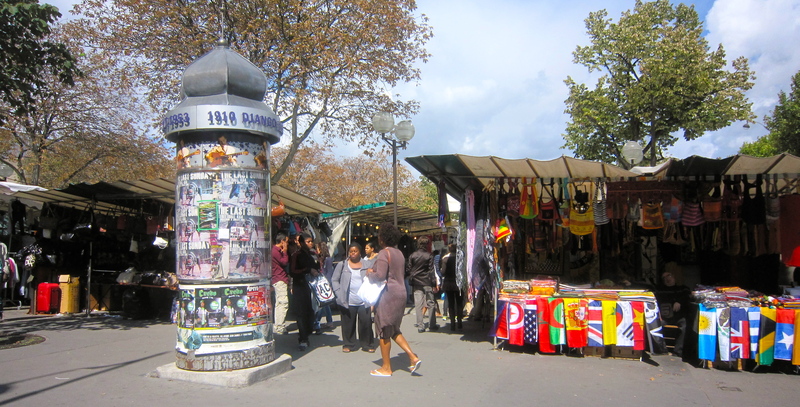 I looked at scarfs and sampled some perfumes, but I didn’t buy anything because the Euro was killing me and the NY stores have the same selection (this was an ongoing theme on our shopping excursions as I realized that almost all of my favorite French products are now available in NY for practically the same prices). 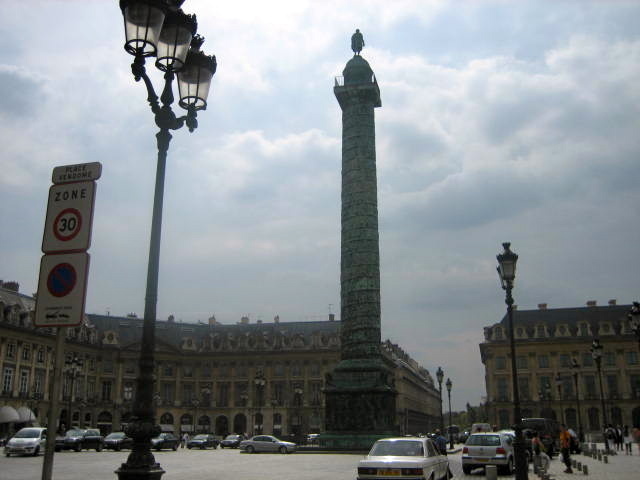 After Hermes we walked over to the Place Vendome, which is a big square known for the famous jewelry stores. It is also the location of the Ritz Hotel, where Princess Diana had her last meal. I wanted to visit the Hemingway Bar, but it didn’t open until cocktail hour. Although the bar was closed, I enjoyed walking through the ground floor sitting rooms, which were quiet/empty and a relaxing change from the Louvre and Rue de Rivoli. We tried to visit the nearby famous toyshop Au Nain Bleau, but it was closed for renovation (Time Out Guide DOUBLE FAIL). By dusk we were tired of walking and decided it was a good time for a bateaux mouche cruise/tour of the Seine. Bateaux mouche is both a name for a type of boat tour and the oldest company that operates such tours. I was a bit confused about the launch point for Bateaux Mouche, so we walked in the opposite direction and eventually settled for a Vedettes de Pont-Neuf boat instead. At 13 Euros, the tour was slightly more than Bateaux Mouche, but the boat was festively decorated with flower garlands and old fashion streetlights (a little hokey, but pretty). 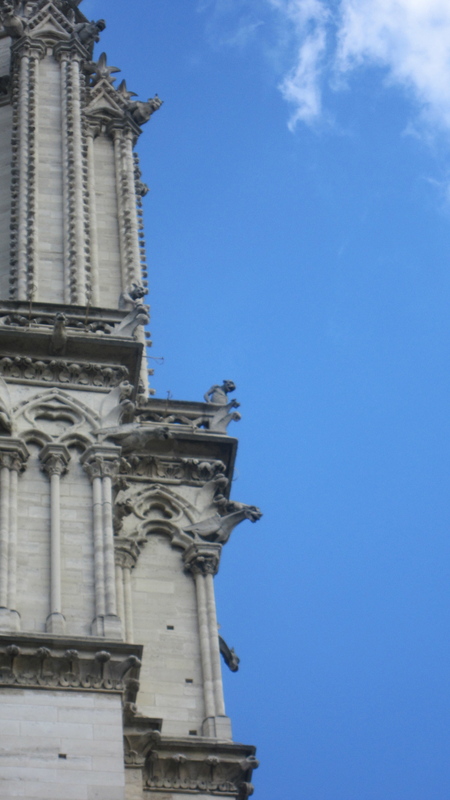 This was my third time taking a Seine boat cruise, but it was the first time I’ve actually listened to the guide and I learned a lot about the history of the buildings and bridges of Paris. The tour also helped me get a bearing on the geography of the city. 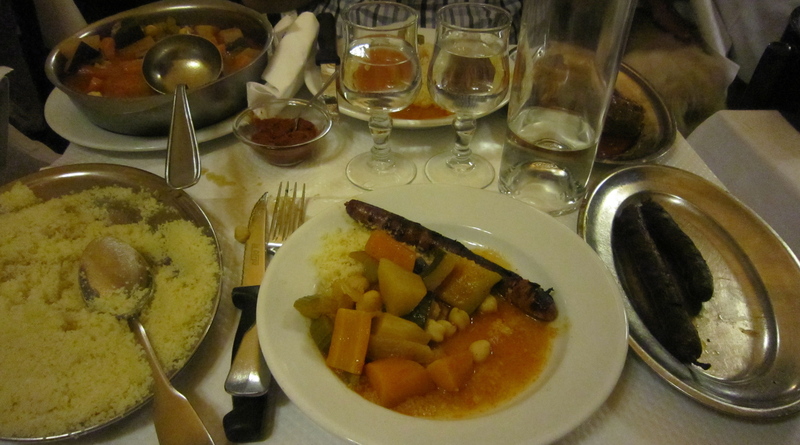 When the boat tour ended, it was dinnertime and we decided upon Chez Omar, my favorite couscous restaurant in Paris. Chez Omar is a little inauthentic because the décor resembles a traditional French brasserie, but the food is delicious and very well priced. 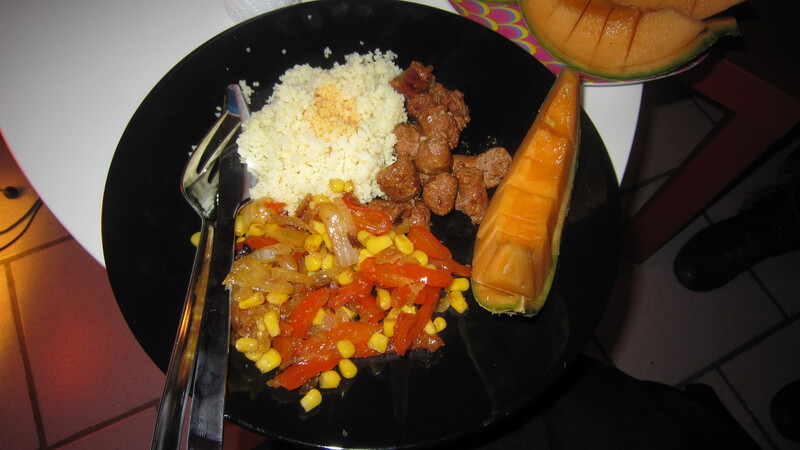 I ordered merguez (spicy lamb sausage), which came with couscous, vegetable stew, and spicy harissa sauce. The restaurant offers free refills of the couscous and vegetable stew, but I didn’t get it because the portions were more than generous. I assure you, this meal tasted better than it looks. After dinner we headed back to my friend’s apartment in the 10th arrondissemont (= neighborhood) and went for a nightcap at the local hangout Chez Prune. The star attraction of the 10th is the Canal St. Martin and Chez Prune was one of the first bars to open facing it. The neighborhood is now very trendy and the bar is considered the bobos (bourgeois bohemians) headquarters, so sitting and people watching made for a relaxing and entertaining way to end the day. Saturday night I attended Target’s First Saturday at the Brooklyn Museum of Art, which is probably my favorite free event. The first Saturday of every month the museum is open until 11 and has free music, movies, lectures, and other programing (sponsored by Target). Although everything except the bar and cafe are free, you have to go early (activities begin at 5) to get tickets for the movies and lectures. You can still enjoy the music/dance party, and art without tickets, which is what I did with my friends. 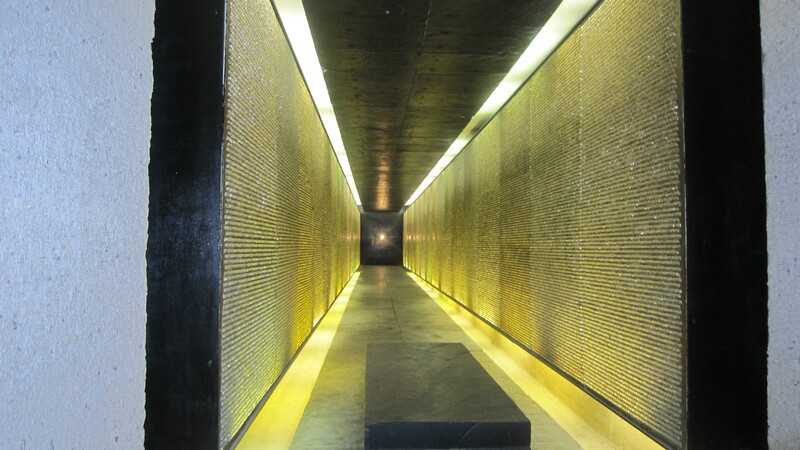 The current main exhibit is The Black List Project by photographer Timothy Greenfield-Sanders. Greenfield-Sanders photographed twenty-five prominent African Americans and filmed them in an accompanying documentary. Greenfield-Sanders uses a 20X24 Polaroid camera to create his signature large format portraits. 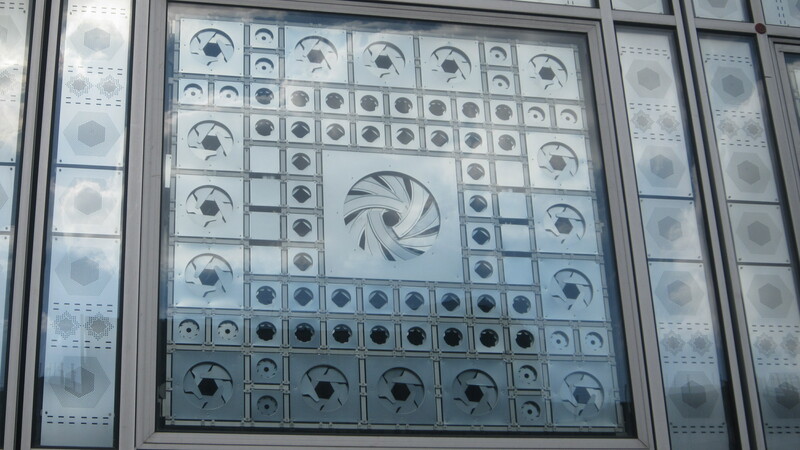 There are only six 20X24 cameras in the world and you can rent them for the day at three international Polaroid studios (my mother rented the camera at the NY studio when I was in middle school and did portraits of our friends and family). I asked my mother why the majority of Greenfield-Sander’s subjects look unhappy because he took her portrait when she participated in a workshop with him. She said he tells subjects not to smile because it isn’t natural. He instructs you to “smile with the eyes.” He also asks subjects to wear a piece of jewelry to make the portraits more personal. Target First Saturday always has a theme and this month it was “Celebrate Women’s Power.” The dance party featured afro-tech music spun by DJ Sabine. There was also a live female jazz singer in the lobby, but we missed most of her performance when we were seeing the exhibits. The BMA is known for their Egyptian wing. The colors in the main room look Disney-esque to me. There is no artist statement with this. I love the textures! Can you spot the doll’s head? This mixed-media sculpture of Queen Elizabeth explores the relationship between contemporary Britain and its colonial past. Near the museum I passed Cafe Shane, which is now serving chicken and waffles. That combo sounds nasty to moi, but I’m partial to the name (I mentioned earlier my real name isn’t Rose…hint hint).